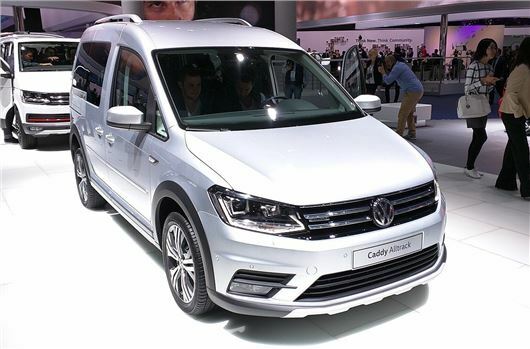 Volkswagen has unveiled an all-roading version of the Caddy van at this year's Frankfurt Motor Show. The new Caddy Alltrack will be available as a panel van or as a passenger car and features slightly rugged exterior styling, with underbody protection, plastic cladded wheel arches and optional four-wheel drive. However, it's not planned to be sold in the UK. We should also point out that the Volkswagen Caddy Alltrack is not intended to rival hardened 4x4s like the Land Rover Defender or Mitsubishi L200, but rather appeal to MPV buyers or commercial drivers who regularly need to navigate muddy farm tracks or rural roads in the winter months. The Alltrack is distinguishable by its 17-inch ‘Quito’ alloy wheels, 'Mojave' beige metallic paintwork and chrome radiator grille. Inside, passenger car versions gets hardwearing seat covers and rear tables, which fold out of the front seatbacks. Both the van and passenger car versions get a leather steering wheel, handbrake leaver and a scattering of interior chrome, along with Alltrack logos and aluminium effect pedals. Power will most likely come from Volkswagen's latest 2.0-litre TDI engines with up to 122PS. 4Motion all-wheel drive will be available as an option, with the choice of a six-speed manual or seven-speed automatic DSG gearboxes.